Remember last year I took up Roller Derby? Well after a year as a Norfolk Brawd I finally passed my Minimum Skills test and am a fully fledged team member, just waiting for my first proper Roller Derby bout. I’m really proud with what I’ve achieved in the last year, though I have a long way to go before I’m as awesome as our current A Team. 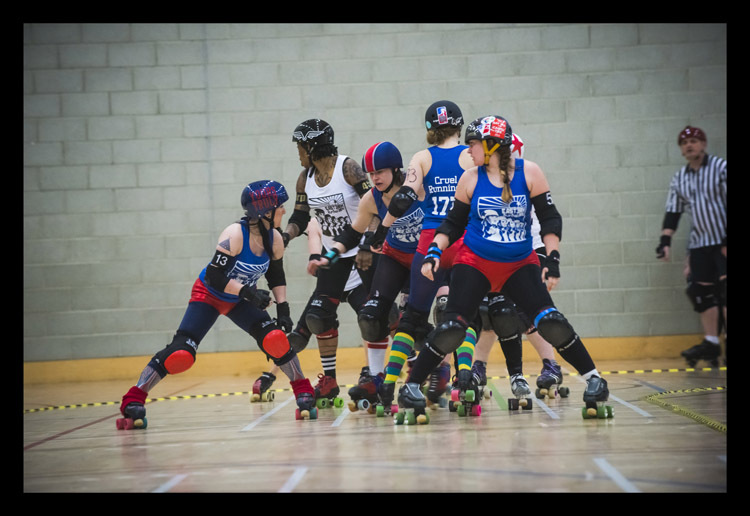 If you’ve never seen Roller Derby, and you fancy giving it a try, then you can come and see my team The Norfolk Brawds in action on 12th July. It’s a South East regional heat for Europes largest interleague Roller Derby tournament, the Heartland Series. Hence why I am not playing. The people who will be playing, however, will be showing off some proper skilled Roller Derby, and are really worth watching! I apologise to those of you who live a million miles away, for todays post is not really for you, but I’m sure you’ll be cheering us along in spirit, and I will, of course, be back to tell you how we got on afterwards! If you’re Norwich based, or fancy a trip (it’s a lovely place!) then the bout is at UEA Sportspark. There’s a full bar and hot snacks to buy during the day, plus activities for children (who get in free with an adult) a shopping area with some exciting stalls selling clothes, accessories and art among other things, plus a pretty awesome raffle featuring prizes from Eclectic Eccentricity, Golden Unicorn and Pin Pin Finds among others! My job is organising the merch stalls in the morning, but I plan to spend the day drinking beer in the crowd as a spectator at this one, so come along and say Hi if you’re coming! I’ll even explain the rules to you if you want! I hope to see some of you there! Hope you have a fantastic day. Good luck!!! My three younger girls (13yo & 10yo twins) play junior derby and they had their first scrimmage the other day. I had never seen them practice as I have class that night but I took the night off to watch. It is so much fun and the coach said Miss 13 will be invited to join the adult derby fit classes and I think I am going to join too. It was so much fun to watch them. We are going to go watch the adult team play soon. One of the ways I earn money from this site is with affiliate marketing using Skimlinks and Shopstyle.